Eduardo Menezes and Tomba on course in the $50,000 HITS CSI-W Grand Prix, presented by Pfizer Animal Health, at the HITS Desert Horse Park in Thermal, California. THERMAL, CA (February 13, 2011)—Eduardo Menezes rode his own Tomba to a triumph over some of the top equestrians in the world during Saturday's $50,000 HITS CSI-W Grand Prix, presented by Pfizer Animal Health, in the indoor arena at the HITS Desert Horse Park in Thermal, California. Menezes, originally from Mexico, now calls Carlsbad, California home and has been knocking on the door for the past three weeks looking for his first Grand Prix victory of the Desert Circuit. In that time, he’s enjoyed two top placings, including a fourth-place finish aboard Reflection Mercedez Benz in Thursday night's $31,000 HITS Welcome Prix, presented by Pfizer Animal Health, and a third-place finish aboard Percynality Mercedes Benz in the $50,000 EMO Grand Prix, presented by Pfizer Animal Health. Last night, Menezes and Tomba kicked down door when they were the best of the 32 horse-and-rider pairs that challenged International Course Designer Florencio Hernandez' (Mexico City, Mexico) first-round track and the three pairs that advanced to the eight-obstacle jump-off track. Hernandez' first-round course featured 12 obstacles and 15 efforts, including two double combinations, a blue skinny and a liverpool in a time allowed of 67 seconds. Menezes and Tomba wasted no time showing the field how it was done! They were second to show and made the successful journey around the track without dropping any rails. One trip later, Saer Coulter (San Francisco, California) and Copernicus Stables' Cash 51 looked as if they would make it two clear rounds in a row but they had three time faults. At the end of the class, Coulter and Cash 51 finished in fifth place. Rich Fellers and Harry and Mollie Chapman's Flexible appear to have the magic touch when it comes to winning in the indoor arena at HITS Thermal. In 2008, the pair captured three of the four FEI World Cup Qualifiers held in Thermal and went on to place second at the Rolex FEI World Cup in Gothenburg, Sweden. This year, the talented horse-and-rider team won the $50,000 Strongid C 2X Grand Prix, presented by Pfizer Animal Health, during Desert Circuit II and scored the blue in the $31,000 HITS Welcome Classic, presented by Pfizer Animal Health, on Thursday night. Last night, they showed in the 11th spot and were poised to qualify for the jump-off but were just a shade over the time allowed and finished with one time fault to end the class in fourth place. Just when a jump-off looked unlikely, Meredith Michaels-Beerbaum (Westlake Village, California) and Richard Michaels' Kismet 50 entered the ring in the 27th spot. They made it all the way home clear and, finally, the boisterous crowd that filled the indoor arena was guaranteed a jump-off. "It was a serious class that was up to World Cup standards," said Markus Beerbaum. 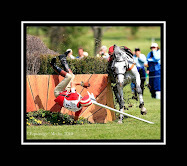 "There were a lot of riders that had four faults and that's always the sign of a good course. It was certainly the toughest course that we have seen so far. If a rider jumped this course clean, they can jump any course." John Perez (Cruz Manca, Coajimaipa, Mexico) and his own La Cantera Utopia crashed the jump-off party when, as the last to show in the first round, they finished clean to give the horse race over fences an international flavor, as Perez and Menezes ride under Mexico's flag and Michaels-Beerbaum is a decorated member of Team Germany. Once Hernandez and his crew adjusted the fences for the jump-off, spectators prepared for a battle for first as patrons in the Charles Owen VIP Club waited with baited breath to see who would lead the victory gallop. The short course featured nine efforts, including a double-combination in a time allowed of 48 seconds, setting the stage for an intense battle for first! 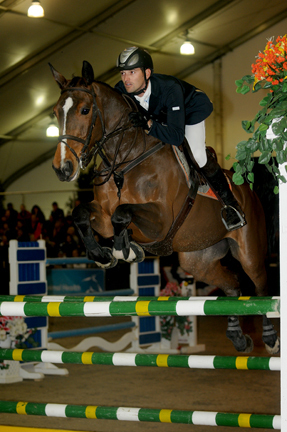 Kicking things off in the jump-off was Menezes and Tomba. With two very talented horse-and-rider combinations sitting behind him, he wanted to be clear and put the pressure on, but an early rail down resulted in four faults. At the end of the class they would be the fastest of the riders with four faults and took home the first-place check of $15,000. 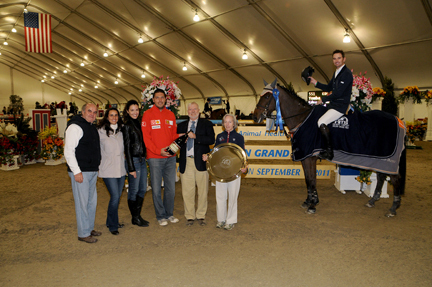 HITS Senior Vice President Tony Hitchcock is joined by USEF Director of Show Jumping Sally Ike and a host of friends in congratulating Eduardo Menezes after winning the $50,000 HITS CSI-W Grand Prix, presented by Pfizer Animal Health, at the HITS Desert Horse Park in Thermal, California. "After I dropped a rail, I never thought I would win the class," said Menezes. "I had two great riders behind me, and Meredith jumped so well in the first round." "My sponsors were all here watching and they had a great time," he added. "I can't even explain how glad we all are to be here." Michaels-Beerbaum and Kismet 50 were second to show and dropped a single rail at the red, white and blue oxer midway through the track and had a time of 41.47 seconds to land in third place. The enviable last-to-show spot belonged to Perez and La Cantera Utopia. An early rail forced them to step on the gas and race to the finish line in hopes of beating the leading time of 39.50 seconds; however, their race to the last fence was too little, too late as they crossed the timers in 40.62 seconds finishing in second place. With his victory, Menezez earned some valuable points in the race for the Platinum Performance Leading World Cup Rider Award. 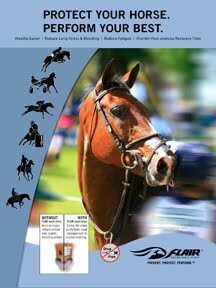 The top rider in the combined four FEI World Cup Qualifiers at HITS Thermal will receive a one-year supply of product, courtesy of Platinum Performance. Action for the High-Performance riders at HITS Thermal continues today with the $25,000 SmartPak Grand Prix, presented by Pfizer Animal Health, which caps off Desert Circuit III as Grand Prix riders continue to shoot it out for a spot in the second-annual Pfizer $1 Million Grand Prix.